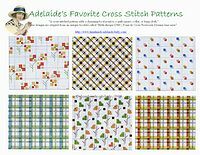 Enjoy these lovely antique cross stitch graphs and printable cross stitch patterns, compliments of Handmade-Adelaide. This wonderful collection of repeating backgrounds lends a fresh handmade touch to any project. I especially love the plaids and the colonial people. I can see these as a bodice inset or as a pocket on a romper or apron. I have sharpened and enhanced these patterns for your enjoyment and non-commercial use. Please feel free to share this page with others by linking back to my site. Click on the links below to open a full size printable .pdf file of each page that you may print or save on your own computer for your personal use. of beautiful free cross stitch charts! includes adorable baby designs inclucing bugs and butterflies, animals, transportation, and other themes. 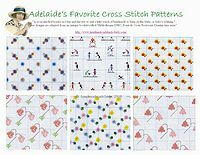 features a wonderful assortment of free cross stitch alphabet patterns, which are perfect for creating a monogram or personalized baby gifts.